Premium quality South cotton jacquard with black threads in weaving. Long tunic with sides closed. Front designer buttons with one button open. Both side pleats with handloom lace highlighted with black fabric trainagles with buttons. Sleeves & bottom hem have inside carrot color fabric border. Color - Dark Grey Length - 48" Sleeves - 17"
Premium rayon bagru print kurti with centre pleat on front as well as sleeves with loops & buttons. (One can close the button to keep the pleats open or close for different looks) Length - 49" Sleeves - 18"
Premium quality rayon slub kurti with beautiful heavy yellow floral embroidery in front all over. Small size floral embroidered boota on sleeves with dori to tie. 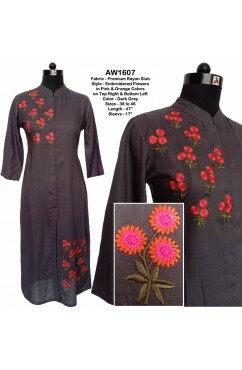 Color - Dark grey Length - 47" Sleeves - 17"
Premium quality rayon slub dark grey kurta with beautiful embroidered flowers in pink & orange colors. 12 flowers on top right & 12 in bottom left making it beautiful for summers. Color - Dark Grey Length - 47" Sleeves - 17"
Premium quality cotton slub with broad checks of zari in weaving. Front top & bottom beautiful motif of embroidery & copper color beads. Beautiful copper beads & threadwork done to look like buttons on placket. Color - Off White Length - 46" Sleeves - 18"
Premium quality Chanderi Straight kurta with finest quality of cotton lining. Beautiful red fabric triangles on placket & sleeves. Beautiful handwork of zardozi with pearl & red embroidry on top left side (5 motifs). 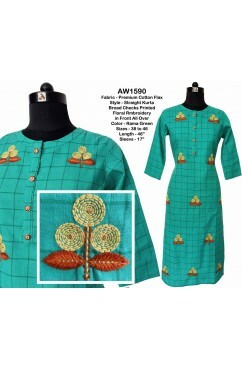 Buttons with handwork of pearl & zari. Color - Silver Grey Length - 48" Sleeves - 17"
Premium quality printed rayon kurta with all over mughal flowers printed with gold print. Front top hand katha work along with sparkling cut dana work. Tiny leaves made of cut dana on placket. Color : Mustard / Dark Grey Length - 47" Sleeves - 17"
Premium cotton khadi straight kurta in ureb cut with short sleeves. Both sides pocket with fabric tussles. Designer sleeves. 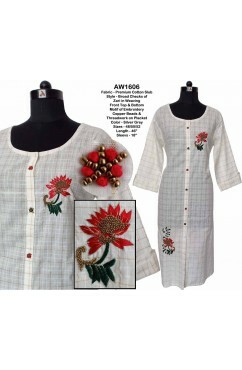 Beautiful fabric flower applied on top right of kurta with designer leafy buttons with beads work & hand katha work. 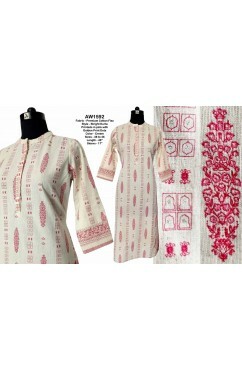 Color - Off white Length - 50" Sleeves - 12"
Premium cotton khadi silk feel kurta with all over small blue booti in weaving. 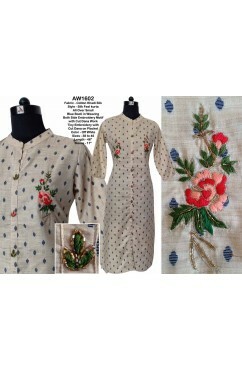 Both side beautiful embroidery motif with cut dana work. Tiny pcs of embroidery with cut dana on placket. Color - Off white Length - 46" Sleeves - 17"
Premium cotton flax kurti with green lahariya fabric piping on neck, front and side slits. Beautiful 27 pink embroidery motifs on front. Dori with thread tussles on neck. Color - Orange Length - 46" Sleeves - 17"
Premium handloom cotton kurti with little flair added to sleeves & fabric triqngles on neck. Top left & bottom right heavy triangles of machine embroidery. Sleeve & front top right hand katha work. Twisted thread hangings on top & bottom. 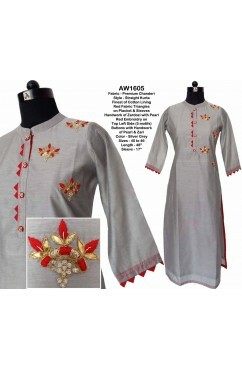 Color - light grey Length - 45" Sleeves - 17"
Premium rayon slub Kurti with beautiful & designer embroidery front all over. Embroidered neck, sleeves and bottom border. Color - Pink / Blue Length - 48" Sleeves - 17"
Premium rayon slub Kurti with beautiful embroidery motifs front all over. Embroidered border on sleeves. 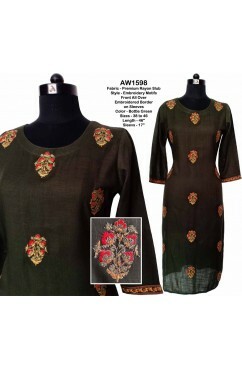 Color - Bottle green Length - 46" Sleeves - 17"
Premium rayon slub Kurti with designer embroidery motifs front all over. Buttons on placket for show. 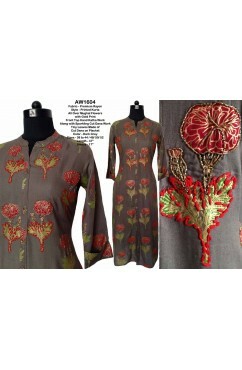 Color - Grey Length - 45" Sleeves - 16"
Premium rayon slub Kurti with beautiful floral embroidery motifs on front and bottom. Thread couching on sleeevs and bottom. Color - Fuschia Pink / Blue Length - 48" Sleeves - 18"
Premium rayon slub Kurti with beautiful floral embroidery motifs front all over and on sleeves. Embroidered buttons on placket. 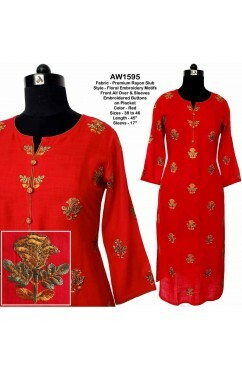 Color - Red Length - 45" Sleeves - 17.5"
Premium rayon slub Kurti with heavy embroidery around placket & front shoulders both side, sleeves and bottom border. Buttons are also embroidered. 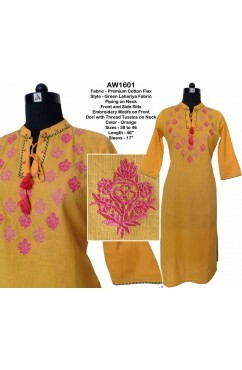 Color - Yellow Length - 45" Sleeves - 17"
Premium rayon slub Kurti in stylish round neck. 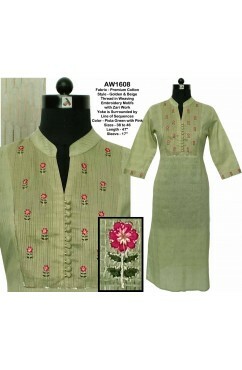 Heavy embroidery with foil mirror work on neck, front, sleeves, bottom n both long sides. 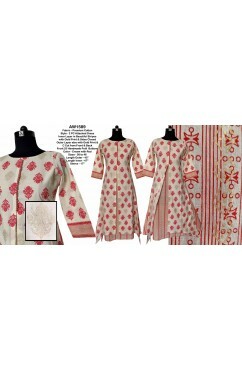 Color - Red Length - 46" Sleeves - 18"
Premium cotton flax Kurti with beautiful prints in pink with gold print dots. 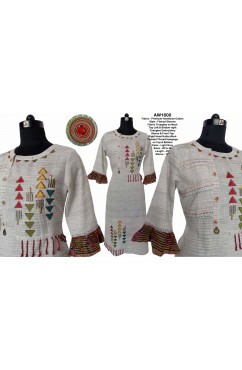 Color - Cream with pink prints Length - 46" Sleeves - 17"
Premium rayon slub Kurti with heavy embroidery on placket and front bottom and back top. Loops on sleeves are also embroidered. Piping & sleeve hem highlighted with red color. 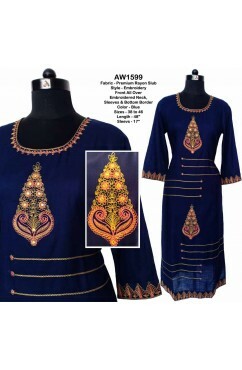 Color - Blue Length - 45" Sleeves - 18"
Premium quality cotton flax straight Kurta with broad checks printed with 11 beautiful floral embroidery done in front all over. 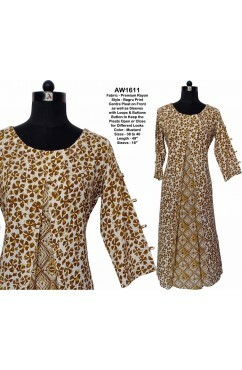 Color - Orange / Rama green Length - 46" Sleeves - 17"
Premium quality finest cotton 2 PC attached dress. Inner layer in beautiful stripes with gold print & sides closed. Outer layer also with gold print & C cut from front & back. Front 25 handmade potli buttons. Color - Cream with red Length outer - 43" Length inner - 47" Sleeves - 17"